Hello! 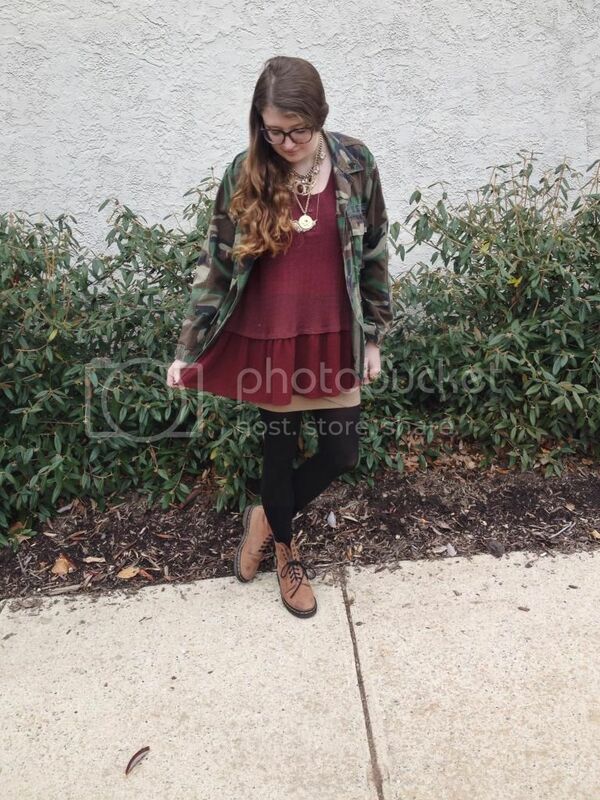 These photos were taken of my outfit yesterday. Yesterday was my last day of classes besides finals and I couldn't be any happier. It definitely feels like a huge weight was lifted off of my shoulders. Now, I'm ready to be done with all of my final exams and projects so I can go back to Richmond and relax. I broke out my favorite burgundy sweater. To keep warm, I layered a simple black long-sleeve top under the sweater and a camouflage jacket over the sweater. I actually like how this outfit looks much better without the jacket but it's definitely too cold to forgo a jacket- even just for a few quick photos! I stepped away from my wide array of black pants and skirts (for the first time in what feels like forever) and slipped into a tan body-con skirt. I've been wearing a lot of black recently and thought that it was time to give this skirt a chance. However, no outfit is complete for me without black so I styled a pair of black opaque tights underneath of the skirt. I emphasized the tan color of the skirt with a neutral pair of Doc Martens. The emphasis of this look was in the details. I love the free-spirited, bohemian vibe that comes from layering and stacking jewelry together. 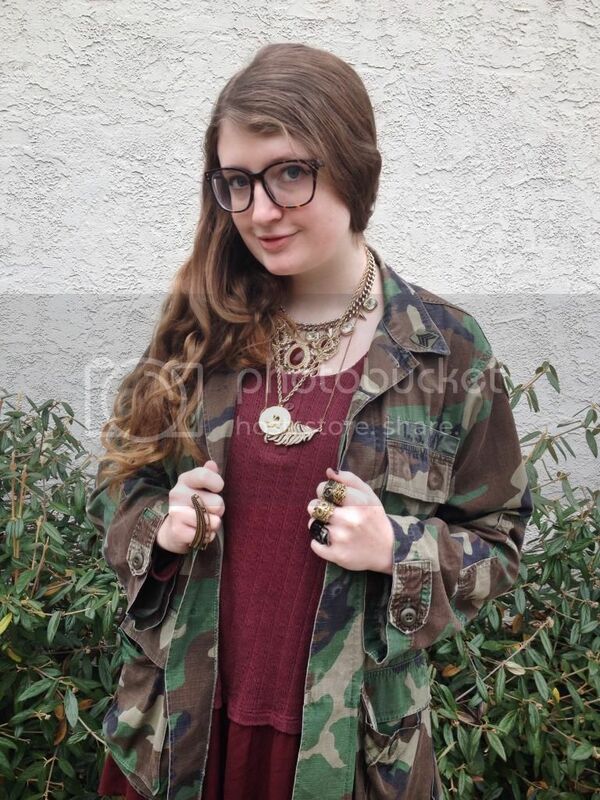 For this look, I chose to layer and stack both rings and necklaces. I decided to go with golden jewelry for this look because I have much more golden jewelry (rather than silver jewelry) and therefore, have more pieces to choose from to layer. When layering my necklaces, I started with a bold stone, statement necklace that hits right above the neckline of the sweater. This was meant to be the focal point of the necklaces. I slipped on several other more simple golden necklaces in varying lengths to compliment the statement necklace. When layering necklaces, the key to getting the look just right is to layer necklaces of different lengths. For example, I grabbed necklaces in all lengths- a shorter chain necklace, a medium length statement necklace and a couple longer pendant necklaces. For the rings, I covered both hands with several rings. On my right hand, I added a statement gold ring. My right hand is my dominant hand and therefore the hand that I use to write with so I usually only like to wear one ring on that hand so I can easily take it off if it gets in the way when writing. On the other hand, I wore a black skull ring, two golden owl rings and a vintage golden ring. I stacked one of the owl rings and the vintage golden ring together for a bolder look. For this look, I wore my pair of tortoiseshell glasses to play up the neutral shades of tan, brown and black in my outfit.